Sean re-joined the restoration for a couple of weeks, until things got busy again for him. It meant that productivity was up and progress was good and I then continued to maintain that progress myself. Weather-wise: we had some bitterly cold weather, followed by the hottest early Spring Bank Holiday on record, cooled a bit again and then became pleasantly warm. I managed to forge through the cold spells with extra layers of clothing. The offside rear wheel arch was finished. Then I turned to the nearside wheel arch (thinking it would be easy and it wasn’t). Sean then opted for making the timber for the nearside front wheel arch. 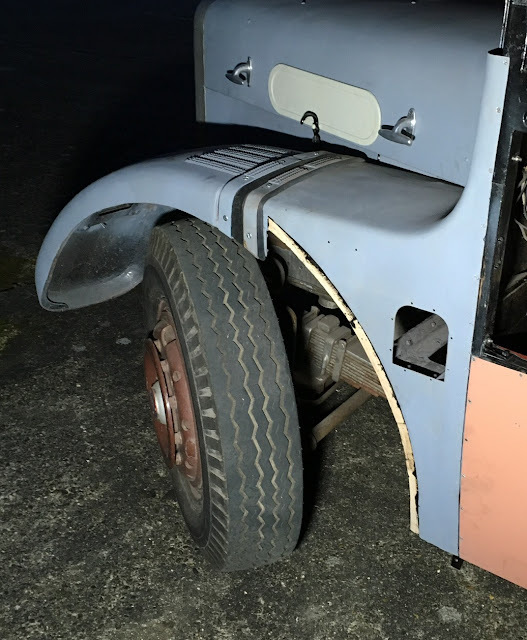 He used the same method as for the timber for the rear wheel arches - creating a cardboard template, refining until it is accurate, using it as a pattern for marking the wood, cutting and sanding down until perfected. Then there was the essential protective coating, assembly and fitting. We worked late into the evenings under floodlights to get the work done. After that, it was back to being a team of one – I cleared out the rear pillars of old wood and rusty bolts, rust treating them, repairing the rear waist rail (welding some steel box channel to the inside/top/nearside edge), preparing and fitting new pillar timber, creating waist rail topping timber, creating a new offside base piece of timber and weatherproofing all the newly added pieces. I also had to revisit the rear sections of both wheel arches, as I wasn’t happy with them. So both were re-done (it’s a lot quicker the second time around). The valance panel fixings on the battery crate both needed repositioning, which was quite a major job, but necessary to get it to fit properly. I had to get under the rear section, so the bus had to go up on my makeshift ramps. I don’t like it being up there for too long as not all of the rear wheels are supported; just long enough to do the jobs necessary. Next up was the rear cant rail and adjoining area. I had tried to avoid looking at it for a long time, as it was rusted beyond repair. But that is not a bad thing when it comes to dealing with it, as there is no question of what to do - rip it out and replace with new. I’m not going to kid you and say it was a 5-minute job. Try 5 days - at an average of 10 hours a day - about 50 hours. The rear cant rail was made to order some time ago and I had to make the corner structure from some steel pieces that I had laser cut and some sheet steel, welding them together. The structure must have been added to and removed from the bus somewhere between twenty to thirty times, to check for fit, make adjustments and treat. From there I made my way forward on both sides of the bus at the cant rail level, dealing with any remaining rust and rotten wood, taking me forward to the bays that have already been done. 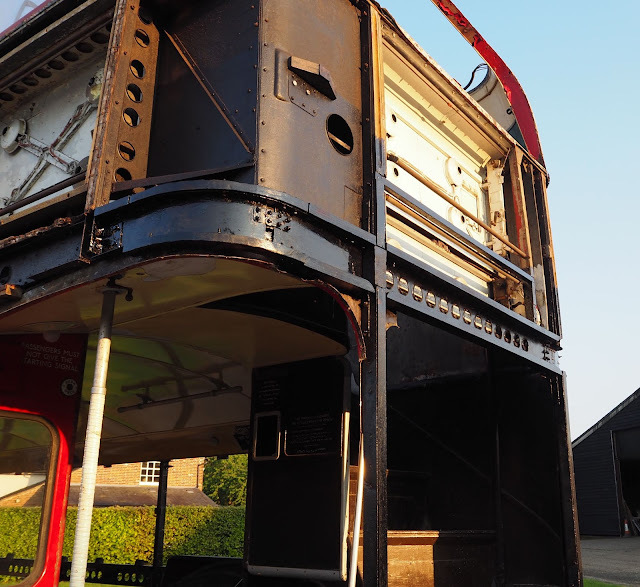 This completes the removal of all the old rusty metal and rotten wood up to this height at the rear of the bus. There was a lot of it; much more than I had expected. The timber becomes harder to remove the higher up you go, as it is less rotten. But it does have a lot of rusty screws in it and no clean/flat outer face, which means that it has to come out. I would turn the better stuff around and use the rear face, but it is only coming off in short pieces and much is splitting as it is tough to remove. The interdeck brackets at the rear of bay 4 need some work. I took advantage of a peak in temperature to rust treat the newly exposed metalwork, for the best result in converting the remaining rust and ensuring that it is going to last. The really badly rusted parts have been cut off and had repair pieces added or be left curtailed as appropriate. I had to use compressed air to clear out the rust, birds nest remnants and other rubbish from the space over the platform ceiling. There was so much of it that it took more than half an hour blowing high pressure air into the section to clear it out, leaving me looking like a bit like a coal miner. I’m not really sure how birds managed to get in there, as although the bus spent many years with access available to them via an open platform, getting into that space would not have been easy. But access it they did and chicks they hatched, with up to about ten quarter inch egg shells left behind and no bird skeletons - a success story. Then, a cold North wind blowing dented motivation and the difference in temperature was very noticeable. Time was not wasted though; a thorough tidy-up was undertaken (I am a self-confessed messy worker, despite believing in the adage of ‘a place for everything and everything in its place’). Low and behold - I found the crowbar that I have been missing for a long time, masquerading as a piece of scrap metal. That pleased me because (as mentioned) the remaining timber is getting harder to remove and the ‘persuader’ is just the guy for the job. Some new wood arrived - to make the intricate pieces above the lower saloon windows. I wasted no time in preparing them for their purpose. A groove was channeled out on one face (the edge that faces inwards) to accommodate the interior rail that borders the window shrouds and the lower saloon ceiling. The rear face of these pieces marries to timber that the window pans fix to. The edges that meet were all treated. All other parts that need treating before assembly were done. Recesses for wood fillets that the shrouds screw to were cut out. The interior will be phase 2 of the restoration, but anything that affects the exterior has to be done during phase 1. I also made two new bespoke brackets for over the platform - one at the front and one at the rear. These provide a method of fixing shaped pieces of wood to the pillars - shaped pieces that the trim can be screwed to that covers the internal/external facings. They are not just screwed to pieces of wood that sit unconnected to anything (as this could allow the facings to sag). The original brackets were rusted to virtually nothing, so new ones derived from old fluorescent light fitting boxes were shaped, drilled and painted. They have a few more holes in than they need, but the donor parts were free and free is a good price for source materials. The extra holes won’t make any difference anyway. Much of the metal I use has been sourced for free, by being a bit cheeky when buying metal box section or angle iron and asking if there are any free offcuts. One man’s trash is another man’s treasure. These particular parts date from the seventies (stamped with manufacture date) when they made things from metal and are now being upcycled for many more years of worthwhile use. There has been a lot achieved in the past month. I had some leftover rust treatment in a cup this week and walked around looking for places to use it. There wasn’t anywhere below the level of the cant rail that needed treatment, which is a major milestone. The more I do, the more I am inspired to do.